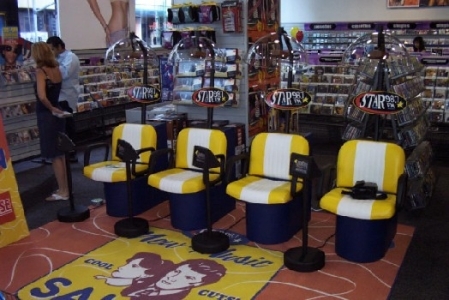 Clear Channel communications and major Los Angeles radio station STAR 98.7 came to The Recom Group to create an innovative New Music Listening Salon. Designed by Wagner Junker Design group this system allows radio station listeners to preview new artist's music at the touch of a button. 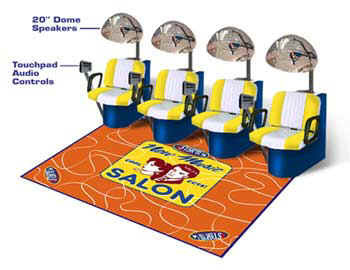 The concept was to make the stations look like a traditional hair salon. 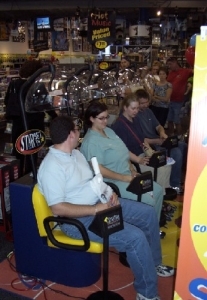 Recom Group created a complete turnkey system that actually plays the music through an overhead sound dome while the user sits comfortably in the chair. All controls are on a separate digital touch pad that allows cd selection, track selection and volume levels. All engineering, construction and components were manufactured and supplied by The Recom Group.